POPCORN POPPER MACHINE and Matching PEDESTAL STAND! By BENCHMARK U S A, Inc. MODEL NAMES: Premiere 6 and Premiere Pedestal. NEW HOLLYWOOD PREMIERE 6 OZ. POPCORN POPPER MACHINE and Matching PEDESTAL BASE FEATURES. DESIGNED FOR COMMERCIAL or HOME USE! The Popper itself is:TWO FEET- 2 INCHES HIGH (26 INCHES). Dimensions of the Popper on the Pedestal: 19w x 14d x 58h > almost 5 FEET HIGH. 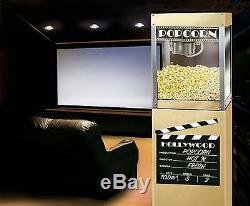 Popcorn Machine and the Pedestal Base are both included in this listing. Popper without the Pedestal or the 4 oz. Version of this popper without the pedestal. All other pictures are for marketing or display purposes only to show you what the Popper looks like by itself. Or for example, in a Home Theater on the Pedestal. USES HOT OIL & POPCORN or POPCORN PORTION PACK'S (Popcorn, Salt & Oil Combo Packs). BENCHMARK U S A PREMIERE 6 oz. POPCORN MACHINE : Domestic 120V: Model # 11068 / Export 230V: Model # 12068. BLACK & WHITE with Silver Corner Posts. POPPING KETTLE - The inner kettle is constructed of thick gauge anodized aluminum for maximum performance and easy cleaning. Aluminum provides the best heat transfer of any cookware approved alloy, while the 20 mil thick anodizing armors the kettle for durability and provides a super-slick surface for easy cleaning. TEMPERED GLASS WINDOW PANELS (Front and Both Sides). Black, Gold & White - "Movie Reel Film" POPCORN SIGN. EASY ACCESS DOORS ON Operator Side (Back). EASY TO CLEAN & OPERATE. MAKES 127 QUARTS PER HOUR (Volume) of POPCORN. Quarts per hour based upon a 40:1 expansion ratio on popcorn. How many single smaller servings? Approximately up to 100-120 ONE(1) OUNCE SERVINGS PER HOUR. POPPER DIMENSIONS & WEIGHT: 19 "w X 14"d X 26h. ELECTRICAL SPECS : 120 VOLTS / 1130 WATTS / 9.4 AMPS. 15 AMP PLUG (NEMA 5-15P) PLUGS INTO ANY STANDARD 110V ELECTRICAL OUTLET. ETL Tested to the following Standards: UL 197 (9th Edition), NSF 4, and CSA C22.2 NO 109 (M1981). AND BENCHMARK U S A PREMIERE PEDESTAL BASE : Model # 30080. The included pedestal base provides storage for all of your popcorn supplies while placing the popper at the ideal operating height, not to mention providing it's own Theater Quality "Popcorn" Sign Graphics. Has a two shelf storage compartment for all of your popcorn supplies. 19w x 14d x 32 h. 4 - Caster Wheels: Allow the pedestal to be moved at will. These high quality poppers have been engineered to provide years of service under even the most demanding of conditions. The user-friendly design of these poppers allows for in-field repairs to be made easily with standard household tools. 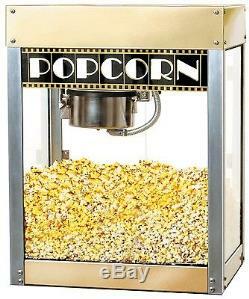 Or absolutely any Item you may want or need for Popping Corn, including Supplies to use with any Popcorn Machine! We also sell an extensive line of all Concession products, including equipment, accessories and supplies - over 5,000 items available! This Popper and Pedestal Base is Ideal For. Commercial Quality: ETL Inspected to: UL-197, NSF-4, CSA 22.2. Available in either a 4 ounce or 6 ounce kettle. Easy to Clean and Operate. 20 mil anodized Non-stick kettle. We will be happy to work with you in all cases, but regarding Payments, please do so before 5 Days. That is only to the Land Locked Lower 48 United States. This price will NOT APPLY to any other destination Address! Up to 2-4 days for Overseas orders. As the rate will cost more, probably a lot more than the above listed rate. Also, a 230 Volt Machine is likely needed if you are an International customer. Please let us know if you need a different Electric Power Plug for your local electrical needs. State, or Province, or Region Area. However, you "could" become responsible. DAYS of receiving any damaged item. Although we would still try to put your claim in for you if possible and will help you any way we can. If Parts become defective during the first 3 Years of Normal Use, as governed in the official Benchmark USA Inc. PLEASE CHECK OUT OUR other items. For Future Supplies or reference! The Second and Third Pictures to the right> Depict the Popper in a Home Theater setting and the Popper "not Mounted on Stand". These 2 pics are for display purposes and to give you a closeup of the popper itself. The item "NEW HOLLYWOOD PREMIERE 6 OZ. POPCORN POPPER MACHINE and MATCHING PEDESTAL STAND" is in sale since Wednesday, February 12, 2014. This item is in the category "Business & Industrial\Restaurant & Food Service\Vending & Tabletop Concessions\Tabletop Concession Machines\Popcorn". The seller is "jgbachman" and is located in Greenville, South Carolina. This item can be shipped to North, South, or Latin America, all countries in Europe, all countries in continental Asia, Australia.